Easter is fast approaching and although the weather has been unseasonably cold I have still been enjoying all the delightful treats the season has to offer. One of my favourite Easter treats is a hot cross bun slathered in butter; and although I am quite keen on making a lot of my food from scratch I have little time and patience for attempting gluten free bread. Some may consider it lazy, but making Hot Cross Buns in muffin form is the easiest way to get your Hot Cross Buns fix without the hassle of actually making bread. As well as being gluten free, this recipe can easily be made dairy free by changing the milk for a dairy free alternative. 1) Preheat the oven to 180 degrees C/gas mark 4, then line a muffin tin with muffin cases. 2) In a large bowl, stir together the flour, baking powder, bicarbonate of soda, orange zest, cinnamon and mixed spice. 3) In a separate bowl, whisk together eggs, sugar, oil and milk until combined. 4) Gently mix together all the ingredients using a wooden spoon until you are left with a batter which is only just combined (don’t worry too much if there are any lumps), then stir through the dried fruit. 5) Spoon approximately 2 tablespoons of batter into each muffin case, then bake for 25 minutes, until golden brown. 6) Leave the muffins to cool completely on a wire rack, while you make icing. 7) To make the icing, mix the icing sugar with 1 – 2 tablespoons of orange juice or water, then mix until the ingredients form a pipeable paste. 8) Transfer the icing to a piping bag and pipe a cross onto each muffin. Be sure to store the muffins in an air tight container and they will last for 4 to 5 days! I love seeing your take on my recipes, so remember to share a snap of your Hot Cross Bun Muffins over on Facebook, Twitter or Instagram using the hashtag #titchytonbakes. Easter Sunday may only be one day away but there is still enough time to get baking some delicious Easter treats. Today I am going to share with you a recipe which is so easy to whip up at the last minute and requires very few ingredients: Vanilla Sugar Cookies with Royal Icing. The recipe is so simple and easy to make – just be sure to chill the cookie dough for a few hours to make it easier to handle. You can make the cookies your own by choosing different shaped cookie cutters and by decorating them however you fancy! They would also make a beautiful Easter gift for anyone you know who isn’t keen on chocolate! 1) In a large bowl, mix the gluten free flour and suagr until combined. 4) Tip the contents onto a lightly floured surface and use your hands to work the ingredients into a soft dough. Tip. Don’t worry if the dough seems a little sticky as it will be refrigerated which help it to firm up – don’t be tempted to add more flour! 6) Preheat the oven to 170 degrees C/Gas Mark 4 and line a baking tray with greaseproof paper. 7) Dust a clean surface with rice flour and roll out the dough using a rolling pin. 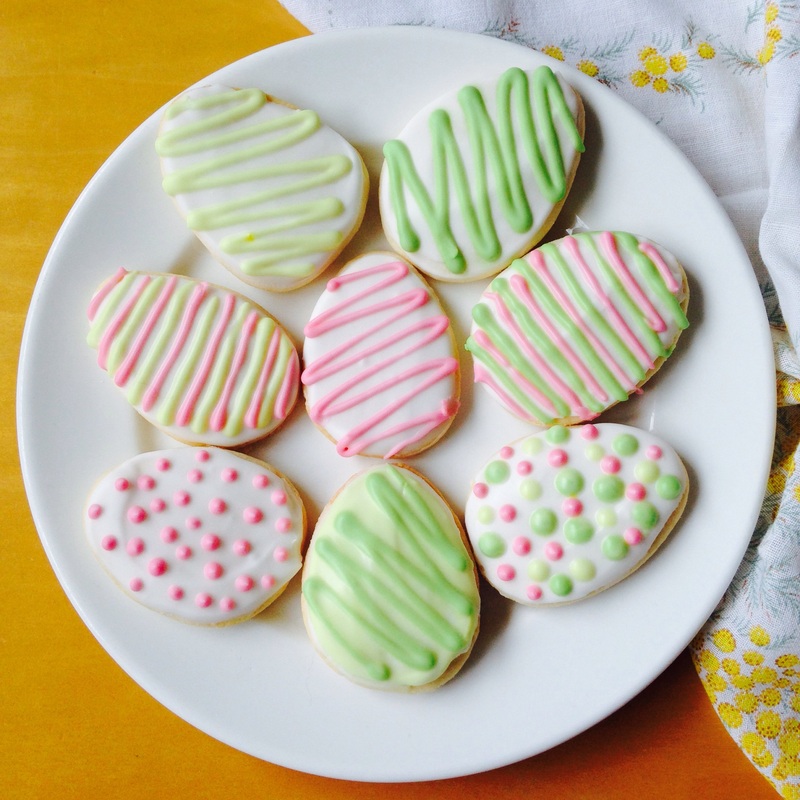 8) Cut out the cookie shapes with your chosen cutters and transfer them to the prepared tray using a palate knife. 9) Bake for 10 – 12 minutes or until the biscuits are firm and a light golden brown – be sure to keep an eye on them as they could quickly over-bake. 10) Transfer the biscuits to a wire rack to cool. 11) To make the Royal icing, place 1 egg white in a bowl and slowly sift in the icing sugar in batches. In between the batches of icing sugar, stir with a wooden spoon or a balloon whisk until the icing thickens up, it is now ready to be used. Transfer the icing into a piping bag, if you are not using your icing straight away cover the bowl with cling film to prevent air getting to it which will cause it to harden. 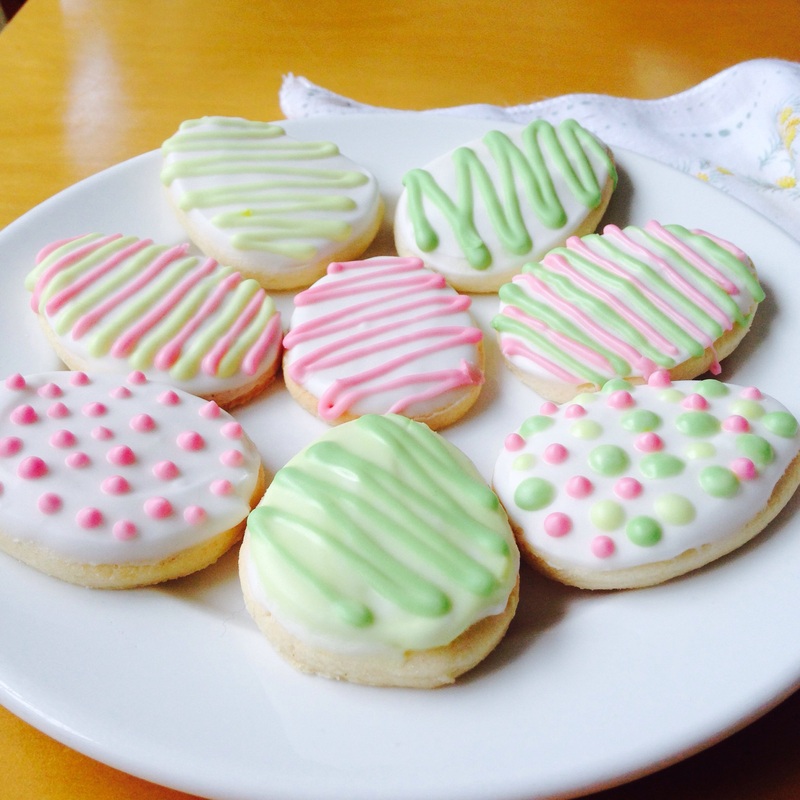 If you wish to decorate the cookies in different colours, simply add a few drops of food colouring to the icing. 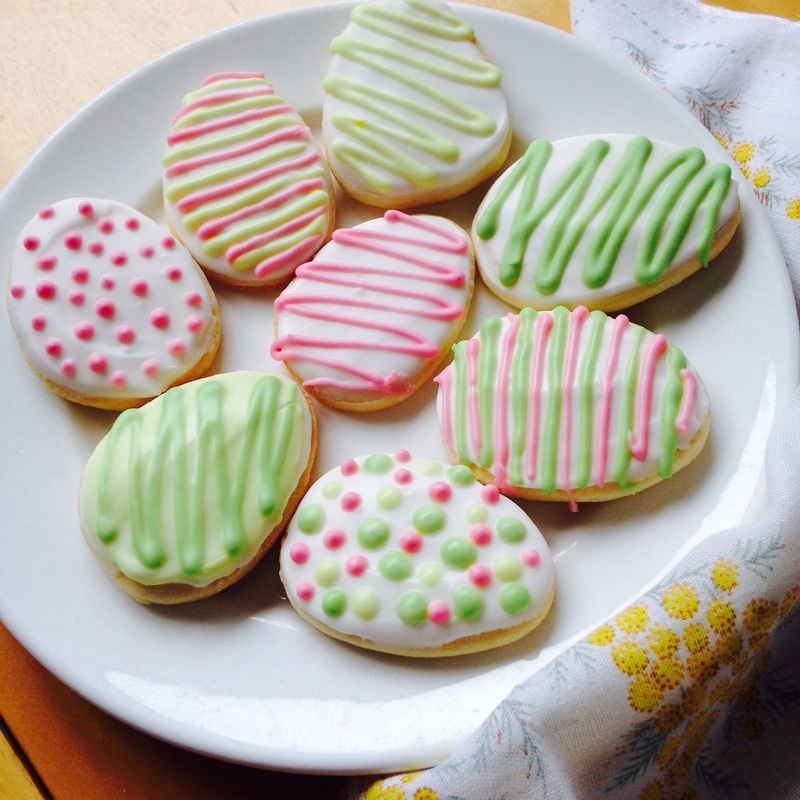 12) Decorate the cookies however you fancy! You can see what else I’m getting up to over Easter over on Instagram or on my Facebook Page. I hope you all have a lovely Easter weekend and eat plenty of Chocolate!